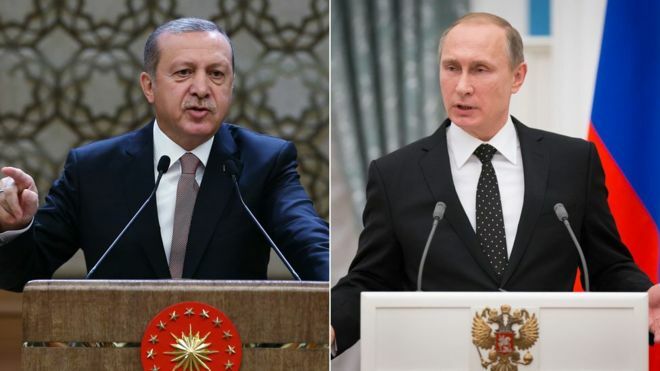 Will Moscow and Ankara continue deteriorate ties? The relations between Russia and Turkey continue to aggravate after the incident of downing the Russian military plane by Turkish air forces. The sides still blame each other for the incident even more toughening accusations and actions against each other. Russia demonstrates a particular fury ceasing relations with Ankara, while toughening ties with this country do not abandon the agenda of discussions in Russia even leaving behind the Ukraine crisis. Russian leadership rejects any negotiations with Ankara, waiting an excuse from Turkish President Recep Tayyip Erdogan, who offered Russian counterpart to meet and discuss the issue. Ankara says Russia’s accusations against Turkey have no grounds, as it has protected its borders and has the right to do it with all possible means. Turkey in fact shows lack of intention and will to escalate the situation with Russia. This situation gives no sign to improvement of ties, which deteriorate even more. Russia always held a stance versus to the West on the topical international issues. Turkey was part of the Western block, which is now angry on Moscow over the Ukraine crisis. Turkey is a member of NATO, which is rival to Russian-led Collective Security Treaty Organization. On the Syrian crisis, they also hold different positions: while Russia supports Syrian President Bashar Assad, Turkey sees the solution to the four-year conflict in toppling of Assad. Despite the disagreement, Moscow and Ankara had no serious problems so far, and were close trade partners. Turkey is one of the major buyers of Russian gas. Fifty percent of the total gas imported by Turkey comes from Russia. Moreover, 15 percent of the agricultural goods imported to Russia come from Turkey. Irrespective of pleasant background of bilateral cooperation, Russia has no intention to make compromises on this incident and has already taken some actions in this direction. In particular, a decision was made to suspend a visa-free regime with Turkey and to ban supplying Turkish products to Russia. Moreover, a complex of restrictive measures on cooperation with Turkey in the economic and humanitarian spheres is under development. After the incident, President Putin decreed to impose special economic actions against Turkey, banning or limiting import of certain goods from Turkey in line with a list defined by Russian government. Some Turkish companies and businessmen had to cease their activities in Russia. Taking into account close economic relations, some wonder why Russia holds so tough position against Turkey. The experts believe that Moscow tries to make Ankara to bow down to its knees using the energy card. Russia has already been hinting at that it may stop to supply Turkey with gas. On the other hand, Turkey considers Moscow’s action over the incident as an effort to use the incident to strengthen its presence in Syria. The recent actions taken by Russia allow saying that Moscow has achieved its goal. In the meantime, Ankara has no intention to step back on the issue and insists in accuracy of its action. Russia’s bans on goods, as well as threats to stop gas supply are not frightening for Turkey. Ankara stated that it could easily replace Russia with other sources of energy. On the other hand, if Turkey makes apology to Russia, then it will have to accept all the accusation against the country -- the plane was downed on Syrian territory; Turkmens are terrorists of "Islamic state" terrorists organization; the position of NATO and the United States is wrong and etc. But, Turkey will hardly decide to take the decision, which puts the country in a very complicated situation. Some experts believe that the situation will not continue in this temp and the two countries will attempt to restore the relations. Moreover, further aggravation of situation is not in the interest of both countries. The economic bans against each other or even of one country against other will eventually harm both countries’ economy. Therefore, it is in their foremost interest to eliminate the confrontation as soon as possible.